Justice Anthony Kennedy Speaks on Civics, Freedom, and Our "little-c constitution"
There's no DNA test for one's belief in freedom, said the nation's most influential justice. "It's taught and learned and discussed." 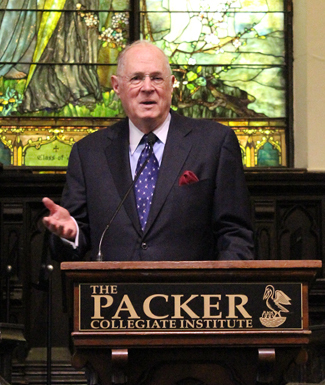 A few days before Winter Break, Supreme Court Justice Anthony Kennedy visited Packer, where he gave a speech to a Chapel packed with unusually hushed Upper School students. The back of the room was packed with staff and faculty from other divisions eager to hear what he would say. Rather than lecture, he offered the Upper School an interactive civics lesson on the significance of the Constitution, posing questions to the audience — "What are the structural features of government that the Constitution lays out?" "What was the system of government it devised that the world had never seen before?" — which the students answered knowledgeably.. He told a story of a diplomatic visit to Poland in which he visited with high school graduates entering an undergraduate law program. Their questions about the U.S. justice system were so sophisticated, he thought it was "a trick." These young European students "understood the importance of civics, of freedom, of keeping the Constitution," expounded Justice Kennedy. "You have to remember: there's no DNA test to see if you believe in freedom. It's taught and learned and discussed." A Reagan appointee, Justice Kennedy has served on the Court for 28 years and is widely regarded as the "swing vote" on a number of historic decisions in the past two decades. Greeted with hushed respect verging on reverence by the student body, this visit by a Supreme Court Justice was believed to be unprecedented in Packer's history. Justice Kennedy is the grandfather of Reese Kennedy '18. 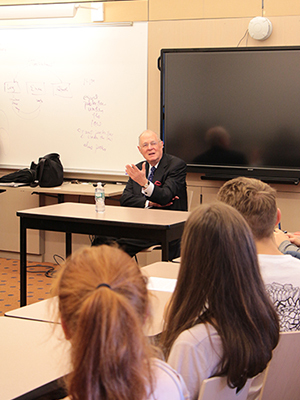 In addition to speaking to the Upper School in the Packer Chapel, Justice Kennedy had lunch with 20 students and visited a 10th Grade history class and two history electives. "In over fifty percent of the world, the verdict on freedom is still out. They are watching you to see what kind of society you have. What have you done with this Constitution you're so proud of? With the freedom you're so proud of? What's your civic discourse like? Are you respectful? Progressive? Thoughtful? Rational? Productive? Do you have art and music and literature of high quality? Do you have good neighborhoods? Do you treat each other nicely? This is what's most important. This is what we must defend." He described these civic attributes as the "little-c constitution" of the United States. The Justice then referenced Periclean Athens, where citizens swore "to engage in civic affairs with our fellow citizens to the end that Athens will be more beautiful, more safe, and more free for our successors than it is for us. "The Athenians thought freedom was the capacity, the duty, and the responsibility to shape the destiny of your times. Freedom as responsibility. "But the Greeks weren't faithful to that oath," he continued, framing a cautionary tale for the students assembled in the chapel. He pointed out that "when the Greeks wanted comfort more than freedom, when the freedom they wanted most was the freedom from responsibility," Athens was lost. "So we must use this precious gift of freedom. We must understand this Constitution (and "constitution") we have. And we must work so that the rest of the world admires us and seeks from us what we have." The Justice closed on an inspiring note. "In a few years, you're going to be the trustees of freedom. And it's yours. One of the things I really like about the musical "Hamilton" — which I understand many of you have seen— is that it reminds us that the Constitution wasn't made by a bunch of old guys. It was made by a bunch of young people with energy! That's what it means to have freedom. And I'm sure you'll give it to us."